UNIVERSITY OF INDIANAPOLIS PASSPORT SERIES presents Dublin Irish Dance live in concert Saturday, Feb. 3, at 8 p.m. at The Palladium. Tickets start at $35.00. Direct from Dublin, this troupe of world-champion Irish step dancers features former members of Riverdance, Michael Flatley’s Lord of the Dance, and Celtic Woman. 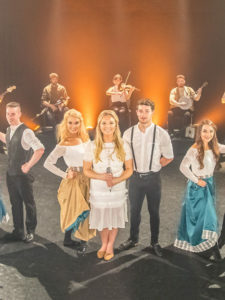 Its current production, Stepping Out, comprises airs, jigs, reels, and other selections that tell the story of Irish immigrants as they journey from their homeland to the New World, where their Celtic culture has blended with that of other immigrant groups to create new forms. The troupe performs with an eight-member traditional Irish band and vocalist.